Let me first say that I am still learning about this hazard and why it is so dangerous. Polyurethane foam is used as an insulating material. More info on it’s uses here. The danger is when you spray it (think: expandable type), or apply it, or cut/remove it after it’s cured. The danger is in the off-gassing. There is a huge potential for work related asthma when using these types of products. And, even contact with the skin can trigger an allergic response/asthma attack. If you have employees working around this type of product and have ANY respiratory symptoms (or asthma), please have them checked by an occupational medicine doctor. The EPA has a quick reference card here (hat tip to Tom), and more detail from the EPA on how to control the hazard here. 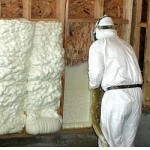 The Spray Polyurethane Foam Alliance has free training here (haven’t checked it out though), and be mindful that anyone can be an instructor (good & bad). Industrial Hygiene in Construction is powered by	WordPress 5.1 and delivered to you in 0.472 seconds using 25 queries.